The pentagram is perhaps one of the most recognizable symbols that Wiccans and Pagans use. The base symbol is the five-pointed star, which can be drawn non-stop without lifting pen from paper. Enclosing the pentagram is often a circle. For many Wiccans and Pagans the pentagram is a symbol that represents magic and magical workings as a whole. For others it’s used as a talisman, a connection to the divine, to open and close circles and a myriad of other ritual uses. Whether seen as a symbol of magic and light, or of evil and dark – the pentagram is probably one of the first things that people associate with Wicca when it comes to symbolism. One of the reasons the interpretation of and uses for the pentagram varies so widely is because it is in fact an ancient symbol, dating back thousands of years. The pentagram has been used to represent religious and spiritual ideas from a wide array of beliefs and religious practices. So, to better understand this symbol and how it relates to the modern Wiccan or Pagan, let’s take a closer look at it’s origins. Some of the earliest known depictions of the pentagram come from areas such as the Near East and Egypt. A jar dating to 3100 BCE was found north of Thebes with a pentagram inscribed on it, and as common with modern ways of creating the distinctive five-pointed star shape, appears to have been inscribed in one continuous motion. In Egyptian hieroglyphics the pentagram enclosed in a circle (argued to be labelled as the pentacle in many circles) meant the netherworld – the underworld where the dead roamed. In ancient Mesopotamia pentagrams have been found, and one dates back to a similar period as the jar in Thebes – 3200BC. At sites such as Uruk and Jemder Nasr pentagrams were found on a tablet and pottery respectively. Although archaeologists hesitate to interpret the meaning of these symbols dating so far back, later depictions in Sumerian and Akkadian cuneiform texts refer to the five-pointed star as showing the regions of the inhabited world. They may also have represented planetary alignments, with Ishtar ‘Goddess of the Heavens’ at the top. In Ancient Greece the pentagram was seen as a way of expressing the ‘golden ratio’, and Pythagoreans considered it to be an emblem of perfection. It was called the Pentalpha and one reason it was thought to symbolize perfection was due to the five geometrically perfect A’s that the lines of the star make. Over time the pentagram has appeared in a huge range of cultures and belief-systems, and meanings have varied in each one. Essentially the only real difference between a pentacle and a pentagram is that they have different origins – one from Greek (pentagram) and one from Latin (pentacle). 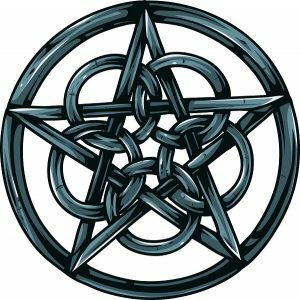 Some schools of Wiccan thought state that a pentacle is the five-pointed star with a circle enclosing it, and the pentagram is simply the five-pointed star by itself. Some Wiccans argue that the pentacle as a five-pointed star with a circle enclosing it represents white magic. However, there appears to be little evidence to suggest this is more than a personal preference traditionally speaking in distinguishing between the two words, based on each individual or coven’s leanings. It is worth noting that in popular tarot decks, such as the Rider Waite deck, the suit of pentacles is represented as the five-pointed star with a circle enclosing it. This could be one of the reasons for that interpretation amongst many Wiccans. 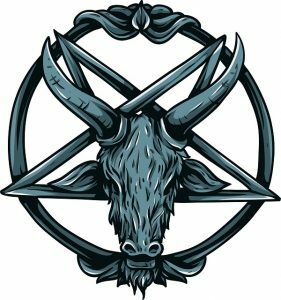 It is true that some satanic practitioners have adopted the inverted pentagram as a way of representing their interpretation of certain energies – for example the Church of Satan invert a pentagram in their ‘Sigil of Baphomet’ – their official insignia. Often this sigil has a goat drawn within the outline of the pentagram to represent Baphomet – the half-human, half-goat figure representing the devil. Previous to this occurrence the inverted pentagram appears to have made its first widespread appearance in the 19th century, and was used by the French occultist Stanislas de Guaita. Eliphas Levi, the famous occultist, believed the inverted pentagram to be a representation of evil and associated it with the horns of the goat (Baphomet) and witches sabbats. Because of these associations, and due to popular portrayals of the inverted pentagram, it can strike fear and aversion into those who see it. However, the truth of the symbol as a representation of evil is much to do with how different groups use it than it being evil in of itself. In some Wiccan circles for example, the inverted pentagram and indeed goat symbolism are closely linked to the Horned God – such as Pan, Hermes and the energies of the wild masculine. In this way the symbol is not evil, but merely a way to represent the powerful energies of wildness, death and rebirth that are associated with the masculine Horned God. In addition, sometimes people associate ‘evil,’ with processes that are in fact natural to our universe. Energies such as death, destruction and chaos for example are all part of nature – alongside, rebirth, growth and order. 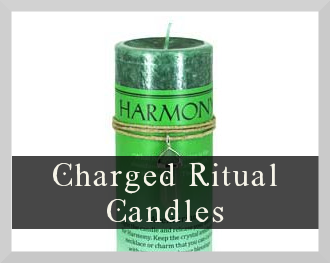 Although the Wiccan rede – ‘and it harm none’ – holds for a large proportion of practitioners, this doesn’t mean that the darker areas of nature should be ignored. For some people the inverted pentagram is a way to explore shadow sides to themselves and magic generally – in the hope of combining them with the light to make for greater integration and effectively positive magic overall. The pentagram both upright and inverted can therefore be interpreted in the context of dualism and wholeness. As with many modern traditions that are a blend of ancient symbolism and modern interpretations, the pentagram can be used in a large variety of ways, with different practitioners and groups finding different energies and uses for the symbol. Because the upright pentagram has become so synonymous with modern Wicca, many practitioners choose to use it as a symbol when undertaking magical working – such as placing a pentagram on their altar, or drawing representations of it in sacred art and ritual practices. 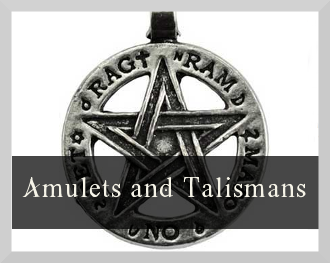 Many Wiccans choose to wear it in the form of jewellery – as a reminder of their religious beliefs or as a talisman. Pentagrams are often used to open and close circles and add potency and power to ritual work. One of the most interesting uses for pentagrams amongst modern Wiccans is in banishing. 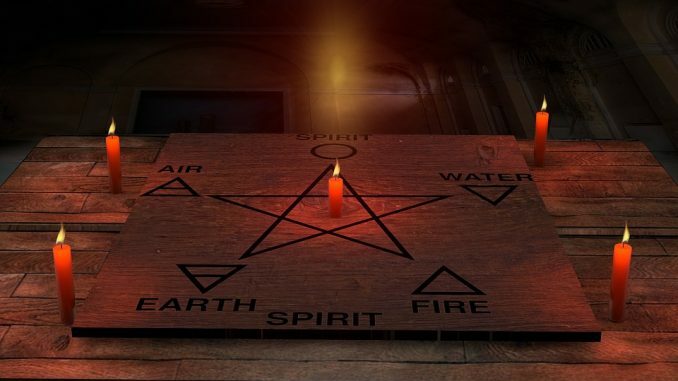 The ‘Lesser Banishing Ritual of the Pentagram’ (LBRP), is a ritual that has become incredibly well known and originated in ceremonial magic with the Golden Dawn – drawn from the works of Eliphas Levi. 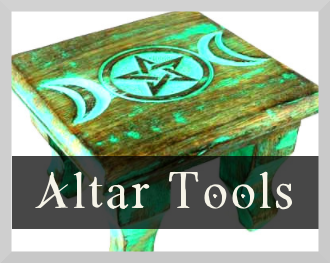 In modern Wicca, pentagrams are often ‘drawn’ using a wand or other magical tool in order to banish unwanted energies – much like in the LBRP practice. 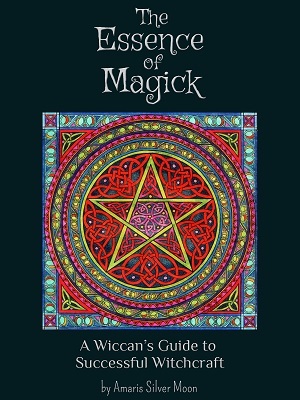 This shows again the eclectic and inclusive nature of Wicca, where energies from many traditions and belief systems are drawn together in a powerful synergy of naturalistic magic. Interpretations of the elements of the elements of the pentagram vary. In early Christian symbolism they are said to represent the wounds of Christ. In chivalry they represent the five virtues of generosity, piety, courtesy, chastity and chivalry. In Jewish symbolism the pentagram was ascribed to the five books of the Pentateuch – which taken as a whole represents spiritual truth. In the Wiccan tradition they represent the four elements – Fire is the lower right, Earth the lower left, Water the upper right and Air the upper left. The point at the top symbolises Spirit – the place where the elements come together and connect us to source. The title of this article is ‘The true meaning of the pentagram.’ As with many other symbols, the meaning often lies in the energy that is given to it – both individually and collectively. For some an interpretation of the pentagram is as a representation of magic and the elements. For others it’s a symbol of negativity or destructive forces. As we’ve seen, the symbol has a long and varied history and different cultures and belief-systems have interpreted it differently, depending on the way the symbol resonated with them at the time. Therefore it could be said that the ‘true meaning’ is simply one of flux and the nature of humans to give collective energy to symbols. This is energy that can be very real and very potent. 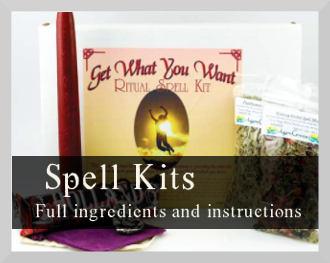 For many Wiccans, the pentagram can bring incredible benefits as way of focusing energy and calling forth protective and effective magical energy. 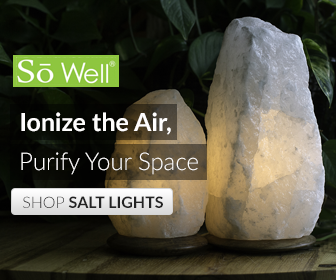 As with many other symbols and ritual tools, often the truth is in the way we choose to use the energy – both as individual practitioners and as groups working magic.